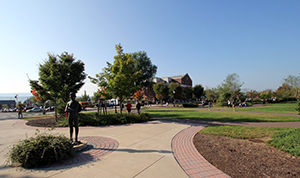 Students who have earned a bachelor's degree at any college or university, including Bloomsburg University, must apply as second degree students. If you are applying to the nursing program, you can only apply for a fall semester, not for the spring or summer. An individual applying for admission to Bloomsburg University to obtain a second degree, must have completed the first degree at Bloomsburg University or another college or university which holds regional accreditation by theMiddle States Association of Colleges and School/Commission on Higher Education or another regional accreditation body. To earn a second degree, it will be necessary for a student to complete a minimum of 30 credits in residence during regular academic semesters and/or summer sessions at Bloomsburg University. All requirements for the major curriculum in which the second degree is earned must have been satisfied and free elective credits must have been taken if necessary to complete the required 30 semester hours. If the same course is required in both degree programs, it cannot be credited as part of the 30 semester hours. It may be necessary to complete more than 30 credits at Bloomsburg University to fulfill the requirements for a second degree. Certificates allow you to gain specialized knowledge that can lead to professional growth or even a new career. Shorter than bachelor’s degree, certificates provide a fast way to jump-start your career! Certificates are available in digital forensics, digital rhetoric and professional writing, medical genomics and counseling, playwork, pre-medical science and rehabilitative justice. Please fill out the certificate application above instead of the second-degree application. Contact the registrar’s office at the college or university from which you earned your first bachelor’s degree. Have an official copy of your transcript sent to Bloomsburg University Office of Admissions, 104Warren Student Services Center, 400 East Second Street, Bloomsburg, PA 17815. Wait approximately two weeks from the time that you have requested the official transcript from the college in which you have your first degree, then email kbulla@bloomu.edu to confirm that the transcript has been received, and to which department you would like the transcript sent for review. You should do this prior to meeting with the department chairperson, so they have a copy of your transcript to review. Present the second degree application to the department chairperson for their signature, and forward it to the admission office along with your $35.00 application fee. The department chairperson must approve the application with their signature for admission. If no signature is obtained, we cannot admit a student. You must call and arrange for an appointment with the chairperson from the department in which you wish to earn your second degree (see the attached list). The purpose of the meeting is to review with the chairperson your official transcript of the first degree. During this meeting, you can ask about the number of credits and courses you will be required to complete to obtain your second degree from Bloomsburg University. Your application will then be processed and you will be informed of the admission decision by mail. This is required for all students whose native language is not English. TOEFL Test: BU requires a minimum score of 500 (paper-based TOEFL), 173 (CBTOEFL), or 65 (Internet-based TOEFL). For information about the TOEFL, please visit the TOEFL website or write to TOEFL Educational Testing Service, 660 Rosedale Road, Princeton, NJ 08541, U.S.A. IELTS Test: BU requires a 6 IELTS score. See the International English Language Testing System website for test centers. Official college or university transcripts in English and also have them evaluated by an outside evaluation service such as WES (World Education Services) or ICD (International Consultants of Delaware). All international undergraduate students are required to submit a Certified Bank Statement in English and converted to US Dollars verifying they have a minimum of $32,696 US. This amount will cover the cost of two semesters at Bloomsburg University. If a sponsor is someone other than a parent, the sponsor's bank statement must meet the above requirements and include the name of the student being sponsored.